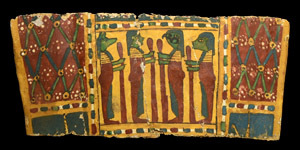 A cartonnage panel depicting the Four Sons of Horus: Duamutef, Imsety, Qebehsenuef and Hapy, each holding a long staff, surrounded by a blue, white and red border; rectangular panels to each side with painted blue mummy-netting, blue panel below. 73.5 grams, 34cm (13 1/4"). Fine condition. Property of a North London gentleman; previously in a private collection formed in the 1990s.